This was our fireplace when we moved in to the 70's-tastic house. Even when we first walked in to view the house before buying, we knew it had to go QUICKLY. But this was not the best task to start with when we moved into the house. This fireplace was a HUGE undertaking and a lot more work than we originally thought. 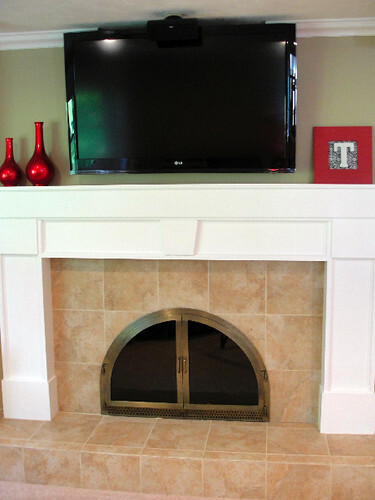 Basically, we wanted to cover up the ugly brick and build a mantle that would match our style. Sounds pretty straightforward, but it definitely wasn't! If you want to see all of the horrible, but hilarious problems we went through, see this post. We started out by building a mantle. The challenge was that we had that concrete slab in the middle of the wall that needed to be covered. The mantle had to be built around it so it would hide inside. Instead of tearing out the brick, we covered the brick in drywall and then added durock in the area we wanted tile. By this time it was the middle of the winter and let's just say it was pretty cold working in a room with no cover on the fireplace! We had to start building fires when we needed things to dry or it would take forever! 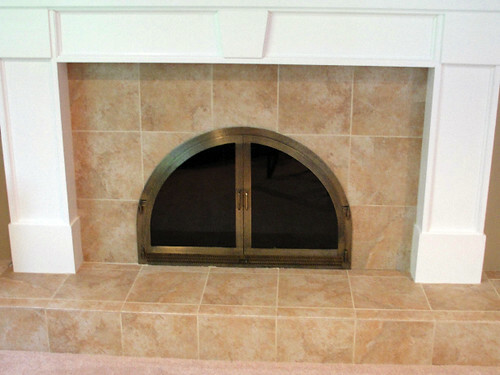 We tiled the hearth and area around the fireplace opening with a simple tan-colored tile to match the wall paint. The next big challenge was how to add the tv, dvd player, cable box and all the wires without having stuff everywhere. I'll give Hubby all the credit on this as he was able to come up with a sneaky solution to this problem. The solution: the room next to the family room is the laundry room and there was a little area of a closet that had no purpose. So we wired all of our component through the wall to these little shelves that Hubby built. Eventually, we'll redo the laundry room and make them pretty, but for now, this works great. Here is our finished tv and mantle! As you can see, we also added crown moulding around the entire room and above the tv to give it a more finished look. We have a remote that works through the wall so we can change channels with the cable box being in another room. I love our tile choice. It looks great with the color of the wall and it's not too distracting from the mantle and tv. Also, notice my initial fame on the right side that I made earlier in the year. Go here for my tutorial. Love the transformation! The mantle is beautiful. Wow, what an amazing transformation. It looks beautiful. I like your mantle. Where did you get the plans? 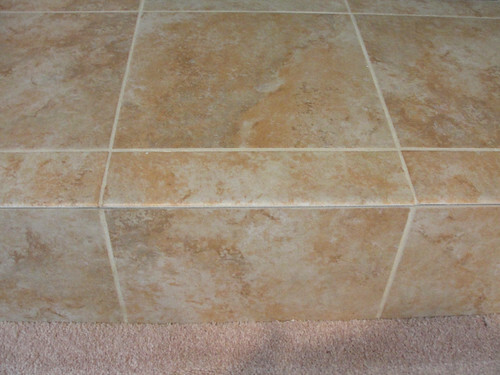 You did a great job, love the tiles, and an excellent way to 'store' the dvd player etc! It looks great!! We need to do the smae thing to ours! Looked about the same as yours did at first!! Wow, it looks amazing! I bet it transformed the whole room. WOW! What a transformation. That looks amazing! Y'all did a great job! AND, I'm totally jealous that you have unused space in your laundry room. What's that like? Beautiful re-do and great solution to the wiring dilemma! I used to work in interior design, so I can appreciate the work that was involved. Thanks so much for visiting my blog and for your nice comment! Wow!! I mean really, WOW!! This is a remarkable update to the fireplace. The fireplace turned out so great!! Love the built in painted too! Wow! What an awesome transofrmation! I love how you covered the old brick, the matle looks great, and what a smart solution for hiding all your electronics. Love it!!! Wishing lots of happy times with family and friends around the fire. 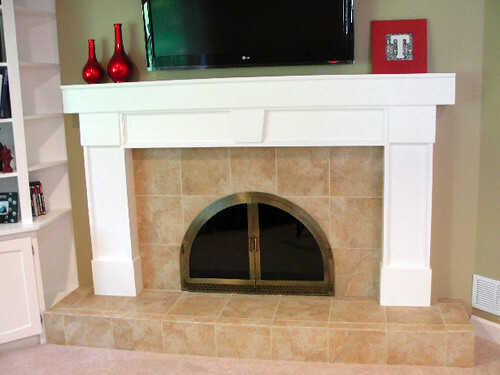 Nice job making a gem out of an otherwise drab fireplace! Fantastic transformation, Lisa! Really nice. Love the mantle. that's flippin' awesome! you changed the whole look with that mantle and drywall, great vision. and what's this you say about changing the channels with the actual bones being in the other room? please tell me how that works! This looks great! 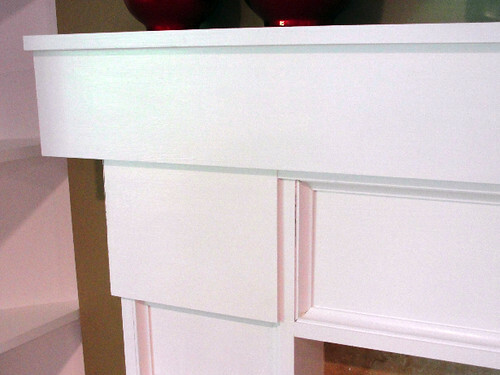 I hope my mantel redo turns out this great! WOW! Great transformation! I've seen so many fireplaces like this before and thought they were a "no hope" situation...you've changed that! All of your hard work paid off! Your fireplace looks amazing...what a difference! Lisa, what a beautiful transformation! I love the style of the mantle that you built, and your tilework looks so professional! It's fantastic that you had that little closet in your laundry room to use to hide all the electronics. Thank you so much or taking part in another "A Little Birdie Told Me". It's always a joy to have you!